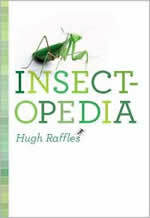 Insectopedia, Anthropology Chair Hugh Raffles’ new book out on March 23, is an exploration of the ties that bind us to the beautiful, ancient, largely unknown species with whom we share the world. Organized alphabetically with one entry for each letter, weaving together brief vignettes, meditations, and extended essays, Insectopedia includes history and science, anthropology and travel, economics, philosophy, and popular culture. The book illustrates how insects have triggered our obsessions, stirred our passions, and beguiled our imaginations. Raffles previous book, In Amazonia: A Natural History won the Victor Turner Prize for Ethnographic Writing and was selected as a Choice Outstanding Academic Title by The American Library Association. Last year, the Mrs. Giles Whiting Foundation named Raffles one of 10 recipients of the 2009 Whiting Writers’ Awards. These highly-prestigious awards, which are $50,000 each, have been given annually since 1985 to writers of exceptional talent and promise. Among the past recipients are Denis Johnson, Mona Simpson, Tony Kushner, Michael Cunningham, Alice McDermott, Ian Frazier, David Foster Wallace, Suzan-Lori Parks, and Mark Doty.